We have a nice master bathroom--not huge or grand or terribly luxurious, but certainly not bad. I'm grateful to have a master bath; it's wonderful to have a space that belongs just to Jack and me. Yet this room had begun to look a bit tired. Now, with two kids in college, "master bathroom remodel" is definitely not high on the list of expense priorities. Anyone know what I mean? I shopped the house and made a few changes for next to no money--and here's my new master bath! I made a number of small changes, most of them free. The one purchase I made was a new rug to match the bath towels. This is the only bathroom in which I don't use white towels, by the way. I'm picky about bathroom rugs--I like a rubber backing so that the rug doesn't skid. And I like for my bathroom rugs to be machine-washable and dryable. I finally found a rug that fit my criteria at JCPenney. $38 was all I spent on this room re-do. Now the ottoman serves as a handy seat beside the garden tub. Beside it sits a basket holding some extra towels and a bamboo back scratcher. I had this blue glass bottle which seemed to want to hang out with the ottoman, so I moved it onto the tub ledge. 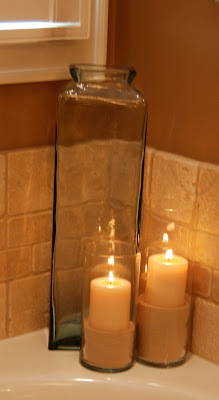 I filled some vases with sand and added small pillar candles from my stash to complete that corner. In the other corner, I already had a jar of sponges and soaps and a jar of bath salts. I mixed a couple of drops of blue food coloring into the bath salts and voila! Another touch of blue. On my side of the bathroom, I added a lamp that used to be in my master bedroom. It's just the right size for that slanted wall. 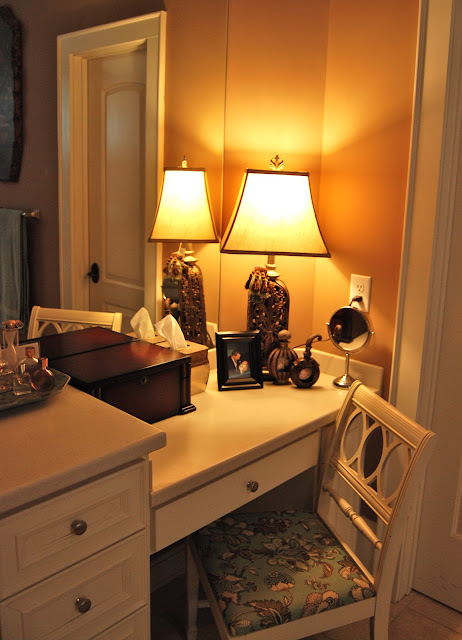 I like having a lamp in the bathroom--it feels so elegant! Now I need to save my pennies for MirrorMates, don't you think? The vanity chair is an old dining room chair that I spray-painted with Rustoleum's Heirloom White and re-covered in another fabric from my bedding. I sit here to fix my hair. Here's a photo with the lamp turned off. I already had the cute frames that look like perfume bottles. They hold photos of my boys from when they were preschoolers. Gosh, where did the time go? 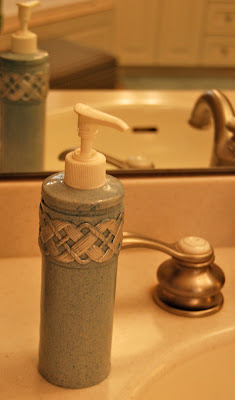 I had an old soap dispenser that used to be brown--I spray painted it a light aqua color, flecked on some dark aqua spots, and then rubbed on some silver Rub 'n' Buff to accent the details. Now to make some time to soak in that tub. That may take more work than re-decorating the room! 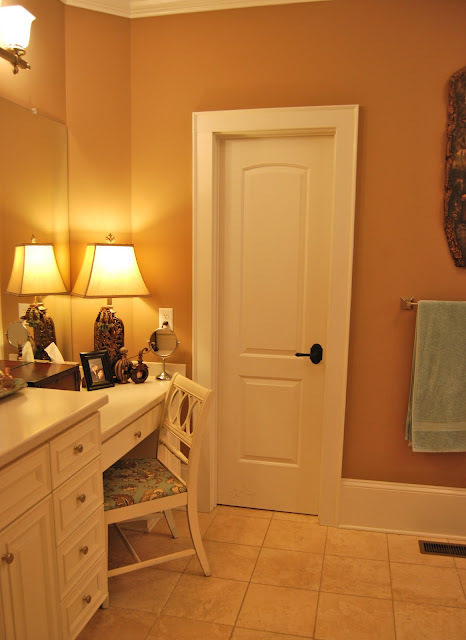 Do you have a master bathroom? If so, how do you keep it looking fresh and lovely? Please share your ideas! Note: The wall color in this room is Sherwin Williams Craftsman Brown. The master bedroom is painted with Sherwin Williams Mystery Green. Oh one more thing, maybe you mentioned it in the post but what is the color on the walls? Love it and think I want to paint my kitchen in that color! Richella, you have done a wonderful job of creating a relaxing sanctuary in your master bath! Very pretty! Enjoy, your home is lovely, I am always happy when I see a new post from you. Very pretty master bath! Great job! We also have a huge master bath with a big garden tub. We have been married 41 years. Beautiful bath, love every inch. Most definitely a place of luxury. Yay! It looks fabulous. I love how you make things over with the little details - e.g. the blue food coloring in the bath salts, the soap dispenser, etc. And the lamp is darling. I meant to say that I also love your attitude & your conscious effort to be grateful for what you have. That is really refreshing. Relaxing bathroom and oh so pretty. Your small changes have made the room even more welcoming. Your bathroom is gorgeous. I would love to have one that big. We are hoping to use Mirror Mates someday too. I have heard great things about them. Oh what a lovely Master Bath! You have such good ideas Richella. I think it looks lovely, Richella! Sometimes those little things like new towels are all you need to give a bathroom a new look. Very pretty! Your master bath looks fantastic!Stopping by from Inspiration Friday. Looks great! I love the colors and accessories you choose. Very nice! Love how you used the canisters! Your bathroom is so pretty! I like how you tied the master bedroom and bath together with fabric. I'm feeling inspired to get my bathroom painted and spruced up after seeing your post! Thanks for sharing! Pretty bathroom and I love that picture of you.